Online Personal Trainer - An old favorite that was used widely by the bodybuilders in the 1960's when bodybuilders still had small tight, lean, waists. It is still seen being used in gyms throughout Dallas an most other cities by personal trainers and individuals alike but it is rarely done in the most effective manner. 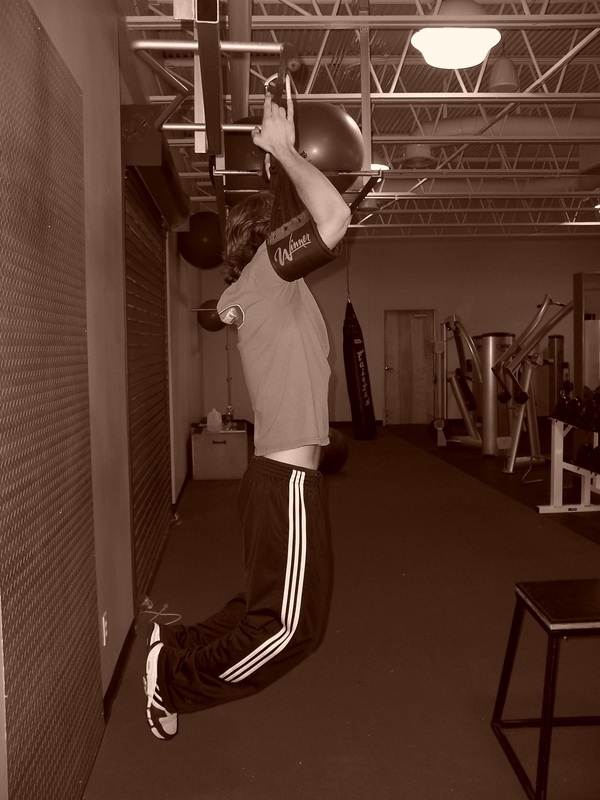 To do these, you can hang from a chin-up bar by you hands, the harness sometimes attached to chin-up bars (as pictured), or a hanging knee raise tower. Put you knees at a 90 degree angle, so that your knees are directly under you, and your feet are out to the back. Pull you stomach in tight (as though you are doing a Vacuum) and then smoothly raise you knees up until the top of your thighs are parallel to the floor. Make sure that your abdominal muscles are still puller in very tight, pause for 1-2 seconds and then lower the legs again under strict control with no momentum. Let your legs go all the way back to the starting position. Without swinging or using any momentum, smoothly begin the next rep. The knees should be at a right angle throughout the entire movement. When you get strong enough to do more knee raises than is prescribed by your workout program, start holding a small dumbbell between your knees as you do them. As you get stronger, continue to increase the weight just as you would on any other exercise. But be very careful adding weight on these... make sure that your form doesn't digress from the ideal at all. 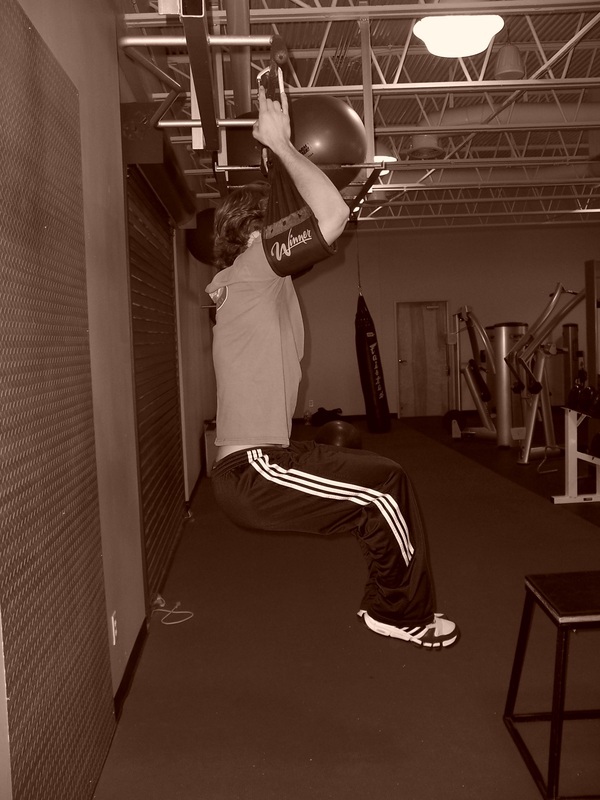 Technique of absolute paramount importance on this exercise and should never be sacrificed to lift more weight. The area that you need to mentally focus on for this exercise is the lower abdominal area (below the belly button, all the way down through the pelvic area). Many people can get their upper abs lean and toned, but most people fail to get their lower abdominal area lean due to their inability to contract and work this area of the muscle correctly. Although you may see tons of people doing knee raises in any gym you go to, at least 90% of them are not getting the amazing benefit that knee raises have the potential to give because of their inattention to technique and their lack of precise focus on the lower abs. Abs, more than most muscle groups take intense mental focus in order to activate them to their fullest and thus get the best results. One person who does 500 crunches may get less out of it than another person who only does 50 because of the difference in ability to consciously stimulate and contract the muscles to their fullest potential. In order to get the most out of this exercise you must intensely focus on a few things: 1) Pull you abs in as tight as possible throughout the entire exercise, especially the lower abs, and especially as you are pulling the legs upward, 2) focus your mind on the contraction of the lower abs and always strive to create a tighter contraction in that are of the muscle, 3) perform the exercise under very strict control without swinging at all, 4) do not lift your legs above parallel (unlike on Hanging Knee Tucks), 4) exhalewith force as you pull the legs up (this doesn't mean you have to blow out alot of air, just blow out a little bit, but make it forceful so that it increases the inward pressure in the abdominal region, 5) pause for 1-2 seconds at the top of the movement and focus on the contraction of the lower ab muscles, 6) do Vacuums regularly to make sure that your capacity to maximize your results on knee raises is maximized (if you can't pull your lower abs in effectively and create lower abdominal pressure, you can't get the maximum benefit from knee raises).